Here is the newest addition to our family. 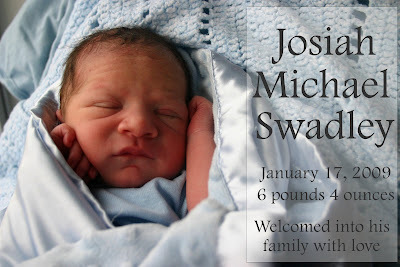 Sweet baby Josiah was born at home, daddy caught him, and big brother Micah cut the cord! Thank you to my good friend GfG for making this cute announcement. I will share the birth story soon! Congratulations! Oh my gosh he is sooo cute! He looks like Michael! I'm so happy for you guys, I desperately want to hear about your home birth. He is beautiful Charlsie! Congrats! He is so handsome! What a special way for him to be greeted into the world! Congratulations! Ok, that is a reason to not blog for awhile, I forgive you now~ I am so happy for you! Get some rest, eat your veggies and drink lots of water. Love on him lots and give plenty of kisses too! Congratulations! He's a sweetheart and we can't wait to meet him. Thanks for posting the sweet photo. He is Michael's Mini-Me! He looks like such a sweet baby! I, too, can't wait to catch up with you and hear all about the delivery. Sounds like it was a special moment, for sure. I am so proud of yoU! You are totally my hero! I'll call you soon and we'll end this ridiculous phone tag! Well baby baby..warm wishes to your newest cuddle! I hope the nursing shawl comes in handy! OK, I have to agree with most of the comments...he does look a lot like Michael. You guys do good work! We love you guys and miss you tons...can't wait to see you all soon. Congratulations! Ah, another precious Swadley. I thought I was subscribed to your blog, but I don't get notifications on my dashboard. How can I "follow" your blog? He is beautiful. Congradulations on your new blessing!